Saxophonist Francois Carrier had quite a week in late May of 2014. It began when he and his long-time percussionist Michel Lambert played with bassist John Edwards and pianist Steve Beresford at the Vortex Jazz Club in London on May 25th and ended with the duo performing with acoustic bassist Rafal Mazur at the Alchemia Jazz Klub in Krakow, Poland on June 1st and then recording the following day. Sandwiched between London and Krakow was a trip to St. Petersburg, Russia where Carrier and Lambert play once again with pianist Alexey Lapin at the Experimental Sound Gallery [ESG 21] and recorded the darkly intense Freedom is Space for the Spirit (see The Russian Concerts Volume 1 for earlier encounters) . Lapin is much different than Beresford, which in itself is not surprising. Playing somewhere near tonality with dense chordal curtains, Lapin evokes the sounds of late Russian Romanticism. Thus, much of the music has a tension produced by the (seemingly) familiar being heard in a different (spontaneous jazz) context. 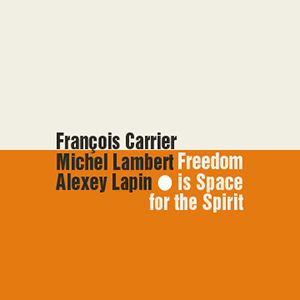 Carrier is a very melodic “free” improviser, and Lapin’s overall sound seems to bring out something deeper from him. Perhaps the quasi-tonality or tonal center allows Carrier’s linear fragments and lines to work off Lapin’s implied tonality. For listeners who “need” to be a bit more grounded, this music does provide that and hence is easier to get “inside” of. The interplay between Lapin and Carrier demonstrates the quickness of their musical reflexes and how in tune they are with each other’s aesthetic. Not be forgotten is Lambert, who can get buried at times beneath the low end of Lapin’s piano, but his presence is essential, if only felt at times rather than heard. Music made in the moment where time and space have collapsed. Track Listing: Freedom is Space for the Spirit; Keep Calm; Happiness not for Sale! ; Nevsky Prospect; Land of Paradoxes.Personnel: Fancois Carrier: alto saxophone, Chinese oboe; Michel Lambert: drums; Alexey Lapin: piano.